In 1864 The Princess Theatre produced a new play by playwright Dion Boucicault, 'The Streets of London', although the play itself received mixed reviews the scenery was an immediate success. Boucicault's skill was in creating sensational but also realistic scenes. The play included a scene at Charing Cross at midnight, which was lit with real lamps, with the backdrop depicting actual buildings and objects; it really did look like the crowded gas lit streets of Victorian London. 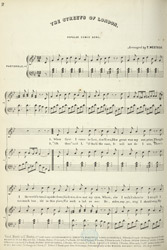 Many Music Hall songs were not original and used tunes and words from existing songs. Singers characterised their own performance and sometimes the adaptation became more popular than the original.